Last week, I posted a bit of fun nostalgia about My Crazy Traveling Friends…Whom I Love. In the opening paragraph, I suggested that I have had to slow down my travel pace so that, for the foreseeable future, my country count will only slowly climb from its current number, 70. I originally put an asterisk next to that 70, but promptly removed it as I knew the explanation for said asterisk was too lengthy for an already-wordy blog. In other words, I’ve been to 70* countries at last count…but for the sake of travel, just what constitutes a “country,” anyway? Humor me, por favor. In 2004, I made my first trip to Asia, laying over in Seoul Incheon International Airport (ICN) for a few hours before continuing onward to Hong Kong. Because I never cleared customs and remained in the transit zone, most passport whores would rightly chastise me for claiming South Korea as a country visited. I do claim South Korea, but for a different reason – I spent two multi-day layovers in Seoul-proper on later Asia trips in 2007 and 2008. That original Hong Kong trip included a very long day trip to Macau, which is independently governed by itself as a former Portuguese colony eventually returned back to mainland China (which Macau touches), in the same way that Hong Kong is independently governed by itself as a former British colony eventually returned back to mainland China (which Hong Kong also touches). Hong Kong deserves several days of any visitor’s time, and I could have easily turned my ridiculously long day in Macau (over on the first ferry of the day and back on the last) into an overnight trip. But I digress. Each country has separate visa regulations and issues separate passport stamps. As an American, I had to apply for a visa if I wished to visit the PRC (People’s Republic of China), and my first trip to the mainland in 2007 kept me busy with pre-departure paperwork. Hong Kong and Macau require no such visas for Americans, feature different passport stamps not only from each other but from the PRC as well, and issue separate stamps when travelling from one to the other. So my trip to Hong Kong included 1) an HK entry stamp upon my initial arrival from LAX via ICN, 2) an HK exit stamp as I boarded the ferry to Macau, 3) a Macau entry stamp upon docking in Macau – apparently the one-hour boat ride was through “no-man’s land” (I love that term), 4) a Macau exit stamp at the end of the evening, 5) an HK entry stamp as I re-entered Hong Kong around midnight that same night, and 6) an HK exit stamp before continuing to my next country, Japan, which resulted in two more stamps. That makes eight stamps in just over one week, all of them side-by-side on the two most impressive-looking pages of my since-expired passport. It doesn’t even include the LAX arrival stamp marking my return to the U.S. at journey’s end! So do Hong Kong, Macau, and the PRC constitute three separate countries, or just one? Sites such as Most Traveled People claim one (with HK and Macau listed as “special administrative zones” of China, or some such thing), but I’m not sure I agree. There is more. I mentioned South Korea earlier. As crazy as this may sound, I’m also claiming North Korea. That’s right, the land of crazy Kim Jong-il and his (possibly crazier) son, Kim Jong-un. Mighty “republic” of forced starvation and ridiculous propaganda, including the world’s tallest flagpole. Let me explain. Alas, it is nowhere near as captivating as it sounds. The de-militarized zone (DMZ) that defines the border between North and South Korea is a fortified “no-man’s land” (there’s that term again) that is probably the most forbidding international border in the world. 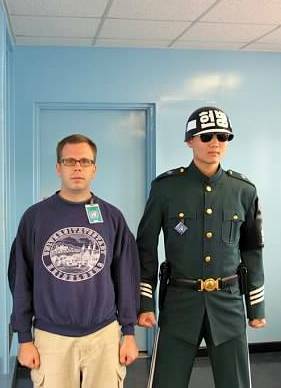 The main crossing, Panmunjeom, is a scary/colorful place where straight-faced guards from both sides stare down their opposition. In 2007, I had the opportunity to visit both sides of the DMZ at Panmunjeom, via a UN-built “classroom” in which a table straddles the border, with chairs on each side for the countries’ respective delegates to hold sporadic meetings. (“Sporadic” as in “never,” but again, I digress.) Amazingly, these tours still seem to be taking place – amazing in light of heightened tensions between the rival nations over the past three years. For about 15 minutes, escorted visitors were allowed to cross both sides of the border – in this classroom only – and be photographed with border guards from both sides. There were no actual passport stamps at the DMZ, but there were multiple passport checks – and always by men with guns – so I’m counting it. I even had to sign a waiver acknowledging that a formal peace treaty was never signed at the “wind down” of the Korean War, only an armistice – which means that technically, the two countries are still at war…and that anything might happen! A friend of mine, who claims to be suitably unimpressed by my boasting but whom I know well enough to assume that he is merely jealous (ha! ), insists that my visit to North Korea shouldn’t count as I didn’t a) spend the night there, b) eat a meal there, or c) go to the bathroom there. Wait a minute, since when were those the rules that determined if a visit counts as an official country to check off (or add to) the list?! What about visiting, say, Bora Bora if you’ve already been to France? Does that count as a new country? Or Greenland, if you’ve previously overnighted in Denmark? What about the British Isles? Few will argue that Ireland isn’t its own country, but most Scotsmen, Welshmen, and Northern Irish will passionately insist that Scotland, Wales, and Northern Ireland are countries. Does HM Queen Elizabeth II know this? Does the word “country” mean something different in that part of the world? You can cross freely from England into Wales and not be any the wiser if it weren’t for county or road signs to point out otherwise. Then again, I learned whilst visiting Cardiff in 2011 that the Celtic language of Welsh is required learning in all Wales schools…but it certainly isn’t in nearby England, even though both places comprise the United Kingdom. What gives? I decided – and I think this is fair – that Hong Kong, Macau, and the PRC constitute separate countries – but that the United Kingdom “countries” are really just four territories that are part of a bigger “mother” country. For me, it gives me a country count advantage in the case of “Greater China” and a disadvantage in the case of the UK. But I’m counting North Korea, damn it – all 15 minutes of it! What do you think, Loyal Reader? What constitutes a country in your mind? And what, to you, constitutes an official visit to a country? Above pic: Yours truly, in North Korea via the UN’s classroom. Okay, so it’s not Pyongyang, but it was still a cool/surreal experience. Below pic: The trees at the bottom of this pic are in South Korea. 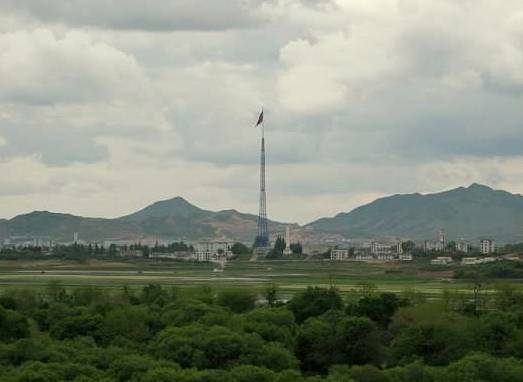 I am looking across the DMZ (the swampy area – a haven for bird life since no people live there) towards a small North Korean settlement, as well as towards the world’s tallest flagpole. According to our guide, the village you see is completely unpopulated, and was built solely for propaganda purposes. Sporcle (a trivia site) recognizes 197 countries: http://www.sporcle.com/blog/2013/01/sporcle-countries-of-the-world-geography-standard/. They include Taiwan, Kosovo and (controversially and IMHO prematurely) Palestine, but the UK counts as one country as opposed to four, and Macau, Hong Kong and other semi-autonomous or special status regions don’t count. This guy spent a few years trying to visit every country in the world without flying, writing an entertaining blog while he was at it: http://www.theodysseyexpedition.com/proof/country-checklist. He counted 201 countries — the above 197, plus the four separate home nations of the UK counted separately instead of together, plus Western Sahara. In his opinion, merely setting foot in the nation counts, as he did multiple “border hops” via GPS. In reality, I don’t think any of us can actually claim to have truly “seen” a place without spending significant amounts of time there. But of course, checklists are fun too. Personally I don’t think airline stopovers count, unless you get out of the airport and spend even a small amount of time in a place. Note: There is no minimum time requirement for a visit. Once a visit has been achieved according to rules 1-3 above, no further qualitative criteria is required (although establishment of proof is necessary if a claim of travel will be made). Does an airport transfer count as a visit? Some travel clubs define “visit” very broadly, to include airplane fuel stops, airport transits, and surreptitious or illegal border crossings. Such arrivals are problematic for several reasons. First and foremost, from a legal standpoint, they are not valid. Without passing through immigration, across borders where passport control exists, a person has not legally arrived in a country. Even if someone were to enjoy an extended time in a country via illegal entry, acceptance of this as a standard would be an encouragement of illegal behavior, something this club is unwilling to do. Second, airport transits without immigration entry and surreptitious border crossings are difficult to prove. For example, photography at border areas, customs control areas, on airport tarmacs and within airports is often illegal. Airport transits offer no entry stamp and require no visa. Airline ticket stubs do not show stopovers en route to a final destination. Border areas often have neutral zones without clear markings in between. Thirdly, time spent in an airport transit lounge, or furtively dashing across a remote border area and back again, does not meet the common sense test for visits. While such actions may involve great planning and effort, in the end they cannot be construed as a proper visit in the spirit of international discovery and brotherhood. Ah, how could I have forgotten about Western Sahara? Thanks for commenting. The creator of MTP.com has done some insane crossings and, yes, swims, to “touch” land in some of those 873 different places. Yeah, though I’ve always found it a bit sketchy that he essentially made up the list so as to ensure that he’d be in first place. It’s like gerrymandering, only on a global scale. FWIW, I “claim” Nicaragua, even though I only border hopped there while on a riverboat ride in Costa Rica that went through a section of river that deviated briefly into Nicaragua. I did get my passport stamped and visit the toilets and snack bar, so technically it counts. But it’s only a technicality; I’d love to go there for real someday. I also “claim” the Vatican and Liechtenstein even though I’ve spent barely a half-day in either. But in those cases, I think they’re so small that a half-day is enough to see the place, so I’d say those are legitimate. I have no issue with any of those claims, segacs. And I’ve heard nothing but good things about Nicaragua, I wanna go there “for real” myself. Hey, since you’ve been: What kind of border formalities are there between Israel and the Palestinian Territories? Any “What constitutes a country”-type issues of note? Well, technically I’ve only been to Israel. I’ve been to areas that are now controlled by the Palestinian Authority, such as Jericho, but they were under full Israel control at the time I was there in the early 90s. And no, I don’t “claim” Palestine on my list of nations — though I don’t actually believe it belongs on the list in the first place. Not yet, anyhow. The whole thing is a bit of a mess that can only be understood if you close your eyes and pretend to be in a Monty Python skit, or maybe a George Orwell novel. Technically, Israel controls all exit and entry points in and out of the West Bank. The Palestinian Authority coordinates with Israel on this control, but these are essentially military checkpoints, not foreign border crossings. The Palestinian Authority issues passports, but these are only recognized as travel documents and not as citizenship documents by most countries of the world. If you cross into the West Bank from Israel, you’ll go through a security checkpoint, but (aside from an art project I heard about a couple of years ago), there’s no Palestinian entry stamp or Israel exit stamp issued. Which leads to the quirk of the Allenby Bridge. If you enter the West Bank from Jordan, you will go through Israeli border control, who may stamp a piece of paper instead of your passport if you ask nicely and they’re in a good mood. They’ll usually do this at other entry points too, by the way, including Ben Gurion Airport. But the key is that Jordan doesn’t issue an *exit* stamp — or an *entry* stamp for re-entering — via the Allenby Bridge. Why? Because Jordan never renounced its claim on the West Bank. It still officially claims to own it. Which is rather silly, because nobody in the rest of the world recognizes that claim. But there you have it, mideast geopolitics; so Jordan doesn’t consider you to have left its territory and therefore won’t stamp your passport on exit or entry. This is why so many backpackers who travel overland through the mideast visit Israel in this way, to avoid the passport stamp that will “prove” that they’ve been to Israel and thus bar them entry from other countries at war with Israel, like Iran or Lebanon. So, the Palestinian Authority has passports, but no border sovereignty as such. It has recognition as a “non-member observer” state by some 130-odd countries from the UN, and non-recognition by the rest. Fatah controls the West Bank in limited cooperation with Israel, while Gaza is controlled by Hamas — both of which claim to be the sole legitimate representative of the Palestinian people. It’s a bit of a mess. Sporcle’s take (and justification for including Palestine among its list of countries) can be found here: http://www.sporcle.com/blog/2013/01/palestine-on-sporcle/. Oh, and also check out their equally interesting post on Greenland, which does not have country status (yet): http://www.sporcle.com/blog/2013/03/greenland-is-not-a-country/. My take is quite simple: Until there is an internationally recognized Palestinian state, as opposed to ill-defined borders and rival government groups claiming control of territories upon which they exercise little real sovereignty, then Palestine can get “autonomous territory” status but doesn’t really belong in the list of “countries”. However, it’s a politically charged issue, and if you ask ten people you’ll get twelve answers. Update: My info is apparently a year or so out of date. Israel apparently announced that it has stopped stamping passports held by people from select Western countries (i.e. those who don’t require a visa to visit) last winter. As of March or April of 2013, all visitors get an entry slip in lieu of a passport stamp. Thanks for your responses. I actually *like* getting passport stamps, so this – for me at least – is a bummer. Heh. I like passport stamps too. I’m a geek that way. I went for my NEXUS interview yesterday and was vaguely disappointed at not being quizzed by either the Canadian or US agent about all the countries I’ve visited.